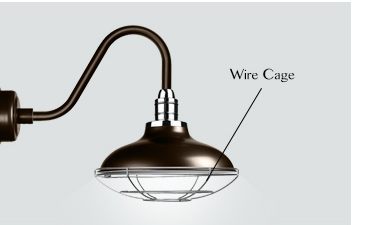 Our Peony Barn Lights Blend Classic Barn Lighting With The Latest LED Technology! Our Peony Barn Light is a fusion of the rustic charm of vintage gooseneck lighting with the sleek lines of contemporary lighting design. 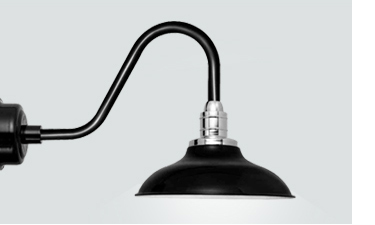 Perfect for kitchen lighting, vanity lighting, or even exterior porch lighting, this lamp features a classically curved shade with a ribbed chrome accent for that modern touch. The Peony is available in 10” and 12” sizes and pairs perfectly with any of our 7 barn light stem styles. 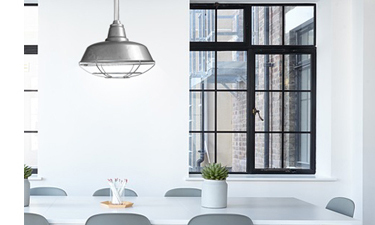 Whether it’s a smaller shade for lighting your kitchen sink, or a larger shade for your front porch lighting, the Peony provides a stylish frame for your indoor and outdoor lighting. 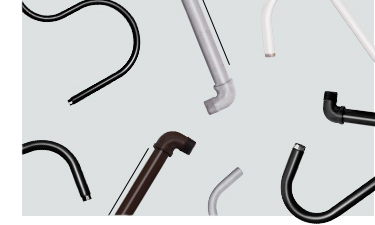 Available finishes include black, white, jade, mahogany bronze, and cherry red. 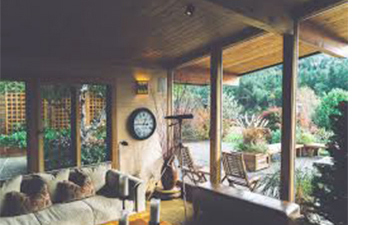 The Peony Barn Light features a high quality steel shade and base which are MET listed for installation indoors and out. 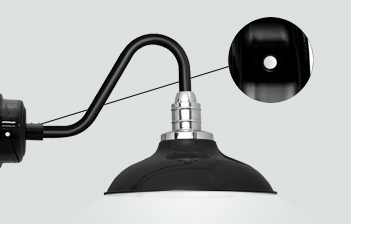 The fixture is fully powder coated to resist water damage as well as to prevent paint chipping and fading over time. Rain or shine, the Peony Barn Light is built to impress. The Peony produces a warm yellow illumination from its integrated LED bulb. Our patented LED technology works at peak energy efficiency to produce a brighter light than a 100W screw-in bulb and use only a quarter of the electricity. 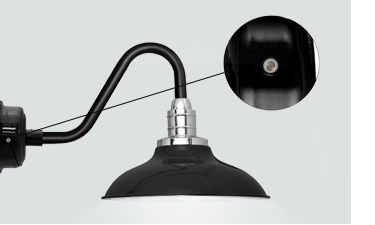 Best of all, our LEDs last for over 50,000 hours and are fully dimmable! Fitted with the latest LED lighting technology, Cocoweb Barn Lights shine just like natural sunlight with a warm yellow illumination. Our LED Barn Lights are highly energy efficient and produce a brighter light than a 100W bulb while using only a quarter of the electricity. 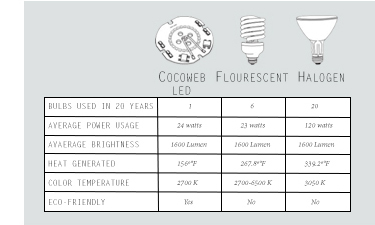 Best of all, our LEDs are fully dimmable and last for over 50,000 hours! Our Peony Barn Lights are available in a variety of different installations to be the perfect match for every area of your home! Complete your lighting design with our Peony Pendant lamps, Wall Sconces, Floor Lamps, and Sign Lights!